The minimum age of a driver is 18 years (23 years to hire a car at Malaga airport, depending on the car model). Children under 12 years of age must be seated in an approved child seat to sit in the front of a vehicle. Seat belts are compulsory for front- and rear-seat passengers. The legal blood alcohol limit is 80 mg. Speed limits are as follows: 50 kph (30 mph) in built-up areas, 90 kph (56 mph) or 100 kph (62 mph) outside built-up areas, and 120 kph (74 mph) on expressways. In residential areas the maximum speed is 20 kph (12 mph). Cars towing a trailer are limited to 80 kph (50 mph) on divided highways, 70 kph (44 mph) on other roads. 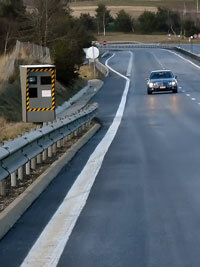 Immediately outside many towns are sensors which detect your speed as you approach the town. There are several speed radars in Malaga, most of them located on the road to Marbella so be careful or you could be fined. If you're going over the speed limit, a traffic light at the edge of the town is automatically turned to red so that you must come to a stop before entering the town. Two red lights mean No entry. Jaywalking is illegal and its prohibition is strictly enforced. Generally, traffic on the right has priority. Normally where a minor road intersects a major road there's a sign reading Stop or "Ceda el Paso" (give way); if such a sign is not in place, the traffic on the major road still has priority. 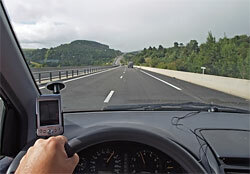 When in daylight and outside a built-up area, you must use the horn to indicate your intention to pass; at night, flash the headlights instead. It's illegal not to use your vehicle's directional to indicate your intention to pass. And if a vehicle comes up behind you signaling that it wants to pass and if you see that the road ahead is clear, you must signal with your vehicle's right blinker to acknowledge the situation. Trams which are stopped and accepting or letting off passengers may not be passed. Foreigners must pay fines on the spot unless they can present a Spanish bail bond or an address of a Spanish friend or company who will guarantee payment of the fine. If the fine cannot be paid or guaranteed, the vehicle will be impounded and the driver detained until the fine is paid. There's usually a discount of 20 percent for immediate settlement. The police will issue a "Boletin de Denuncia" which specifies the offence and the amount of the fine. Check carefully that the fine amount noted on the document matches the amount you paid. Follow the English instructions on the back of the document if you want to dispute the charge; you have 15 days to file a written dispute - you can write your argument in English. In some cities a blue line on the street indicates resident-only parking; in other cities, check for signs. Don't leave anything of value in a parked vehicle. Parking garages are a safer alternative to the street, but you might wanna check prices before you enter with your vehicle. On one-way streets, parking is allowed on even dates along the side with even addresses and on odd dates along the side with odd addresses; in both cases, park in the direction of traffic flow. Do not park within 5 metres of intersections or entrances to public buildings. Blue Zones or Zona Azul are indicated by signs. Parking in these zones is allowed for 1.5 hours from 8am to 9pm. Parking discs can be obtained from hotels, travel agents, or the town hall. Some large towns have Zona ORAs in the centre of the town; parking in such a zone is allowed in conjunction with display of a ticket which must be bought at a tobacconist; tickets are valid for 30, 60, or 90 minutes. Illegally parked vehicles may be towed. EC format pink/green licence is accepted; old-style green or non-European licence must be accompanied with an International Driving Permit. Fuel prices are government regulated, so don't waste time shopping around (though this may soon change). Some fuel stations accept credit cards. Regular leaded petrol has an octane rating of 92; the octane rating of super is 97. Unleaded petrol is called "gasolina sin plomo". Unleaded super petrol has an octane rating of 95. Diesel is called gas-oil or diesel as well. LPG is called "gases licuados del petróleo". Be warned though that the smaller roads that are alternative to the toll road are often single carriageway and can be a much slower route.